Comics aren't for the faint of heart. I don't mean that they're too violent or sexual or whatever else fires up moral crusader passions - I mean the very act of picking out a comic series to read can be incredibly confusing and stressful. Whether it's superhero serials with decade-long backlogs or thousands upon thousands of creator-owned comics, the whole medium can feel impenetrable, and that's before you even consider price and availability. It almost makes you want to walk away from comics entirely, partaking only of the few Marvel movies that slip out of that ink-stained labyrinth. But what if you had a starting point? Something familiar, letting you draw from previous knowledge that cushions your fall into a pile of paperbacks and single-issue releases? Like, say, a comic based on a video game? If that sounds like your jam, then I have good news: there are now a plethora of video game comics on the market, proper ones done by proper comic authors and artists, with the help of the games' creators to boot. To help you figure out the best way to launch into game-comic readership, we've collected some of the best you could be reading right now and the optimal place to snag them. Read on, and if you think we missed a great title, sound off in the comments - help your fellow readers, and we'll get through this together. Mages can't seem to catch a break in Thedas, but the people sent to hunt them may just have it worse. Running concurrently with the events of Dragon Age: Inquisition, Dragon Age: Magekiller follows a pair of warriors with a special set of skills (three guesses what they use them for), who are on the run from the big, bad, mage-filled Tevinter Imperium when the sky opens up and leads to whole new set of job opportunities. Taking place on the fringes of the Inquisition, it fleshes out a dot on the Inquistor's map into a gallivanting adventure with a polished and expressive art style, ripe with grand set-pieces and visual humor. Wrap all that around a story penned by Greg Rucka (of Lazarus and Wonder Woman fame), and you have a killer addition to any comic collection. Yes. Where to get it: Magekiller's a pretty young comic, so those in search of a collected edition will be waiting a while. If you're not allergic to single issues though, it's available in digital form at the Dark Horse store and the always generous Comixology. It takes special skill to really capture motion in still form, especially the kind of kinetic movement that's at the heart of Mirror's Edge. Thankfully, Dark Horse clearly didn't cut corners when it picked out the team behind Mirror's Edge: Exordium, the comic prequel to Mirror's Edge: Catalyst. While it sets up the new premise behind Faith's life (she's still an anti-establishment, black market runner, but this time kid sister apparently didn't make it), Exordium goes heavy on the parkouring action, trading fully realistic visuals for an art style that emphasizes action and flow - the pictures may be still, but you can envision exactly what's happening without having to think twice. Plus, it throws in more than a few juicy pre-game tidbits to clue you in on what's coming next. The meaning behind Faith's new tattoo for instance. Where to get it: A collected edition of volume one will be coming out on May 17th, just in time for Catalyst's launch a few days later. But if you don't want to wait that long, all the usual suspects can assist with single issues. Co-written by comic giant Gail Simone and the lead writer of the Tomb Raider reboot, Rhianna Pratchett, Dark Horse's Tomb Raider comic puts Lara Croft in the hands of creators you know will treat her right. Its takes place between the reboot and Rise of the Tomb Raider, giving insight into Lara's personal struggles as she deals with the fallout from her time in Yamatai. It also gives a nice introduction to Trinity, the shadowy organization she's destined to encounter in her search for all manner of things mythical, priceless, and powerful. Her adventures take her to some strange places, from the jungles of South America to the subway tunnels and theater stages of London, all lovingly rendered by a rotating group of talented artists. But the comic really hits its stride in the second arc, which sees Lara traveling to the Chernobyl Exclusion Zone and facing off against one of Trinity's cruelest operatives. Best place to read it: Issues can be purchased individually from the Dark Horse website/app, with full volumes available as well. Shepard may be the savior of the Mass Effect universe, but s/he isn't privy to everything that goes on in its vast expanse. In fact, s/he doesn't even know everything that happens on the Normandy, and that's where the Mass Effect comics come in. Considered fully canon (and written/co-written by Mass Effect lead writer Mac Walters), these comics cover events that only get cursory attention in the games, like the First Contact War, how Liara got her shadowy title, or what everyone was up to while Shepard was in stasis. Featuring gorgeous full color art over 27 issues, there's more than enough here to help fans occupied during the wait for Mass Effect: Andromeda. Plus, how could you resist the tale of a Kirk-like Hanar named Blasto? Best place to read it: Those who prefer physical media have plenty of full volumes to choose from, but those who prefer digital comics get the benefit of cheaper bundles. It takes some serious creativity to pull a coherent plot out of a game like Team Fortress 2, which doesn't have a hint of story and centers around a bunch of mercenaries wearing weird hats. But the Team Fortress 2 comics pull it off, because if nothing else, they are very creative. Acting as accompaniment to the game's biggest updates, the comics build an erratic, yet plausible storyline where the sudden emergence of robot soldiers and haunted swords actually makes sense. It's all as ridiculous as you'd expect, and the comic's absurd sense of humor is what really pushes it into must-read territory. It's the story Team Fortress never needed, yet is so much richer and funnier for having it around. Best place to read it: All the comics are free-to-read on the Team Fortress 2 website, but if you really feel like spending money, several are available in The Sacrifice and Other Steam Powered Stories compilation (alongside a pair of Left 4 Dead and Portal comics). When a game works well, there's little need to reinvent the wheel to make a comic of the same property. Or reinvent the cog, in the case of the Gears of War comic. Focusing on minor characters and miscellaneous happenings between the events of Gears and Gears 2, the Gears comic succeeds by focusing on what made the original so enthralling: a gritty and melancholy setting, sharp attention to detail, and plenty of heart-thumping, chainsaw-based brutality. It doesn't exactly tread any new territory, but does such an excellent job of translating the spirit of the Gears games onto the page that it really doesn't need to do anything else. Best place to read it: The full digital collection is available on Comixology, with three physical volumes available at retail. The Last of Us has a fine prequel in the touching Left Behind DLC, but it never hurts to get a little extra love. That's what's to be found in The Last of Us: American Dreams comic, a prologue to Left Behind that focuses on the relationship between Ellie and Riley as it develops in the confines of an oppressive military boarding school. Though it boasts an art style closer to Scott Pilgrim than the CGI of its source material, American Dreams' story is appropriately poignant, and introduces the reader to a new, delinquent side of Ellie. Integrating itself into the grander story through the smallest of details but immediately feeling like part of the whole, American Dreams deserves a place on any fan's shelf right next to Naughty Dog's apocalyptic opus. Best place to read it: Digital version of all the issues can be purchased directly from Dark Horse, or from Amazon if you're willing to pay a bit more for a Kindle or paperback edition. With nearly two decades of games to its name, Silent Hill has a plethora of content to fill out its small and ill-lit universe, and just as many gaps for new stories to fill in. Spanning 25 issues, the Silent Hill comic series tells eight standalone stories that take place within Silent Hill, each focused on a new unfortunate soul that wanders into its foggy confines. Each has its own unique art style (Downpour: Anne's Story has a realistic look with a high level of detail, while Dead/Alive resembles a disturbed child's sketchpad) and take on the nature of the town, letting each new volume approach fear in its own unique, perfectly unsettling way. Best place to read it: This one's a little tricky, because while the series has an excellent Omnibus edition, it's not exhaustive. Thankfully, the volumes it doesn't include - Past Life, Sinner's Reward, and Downpour: Anne's Story - can all be purchased separately. A world the size of Thedas can't be contained in a single game, and even after three it feels we've only just breached the dragon's lair. The Dragon Age comic trilogy guides us a little further inside with a new story about the adventures of companions Alistair, Isabela, and Varric as they search for Alistair's lost royal father. Though the story is thick with Dragon Age lore and might seem inaccessible to those just getting into the series, the density of its narrative detail is perfect for fans who already know enough to make sense of it. That's in addition to the impressive visual detail in the book's beautiful, polished illustrations. Though it's only a trilogy, there's plenty of material here to keep fans busy during the wait between Magekiller issues. Best place to read it: Buying the three volumes separately is an option if format is an issue, but the hardcover Dragon Age Library Edition is the prettiest and cheapest available option. Master Chief may not talk much about himself (or anything at all), but that silence conceals a fascinating backstory that defines the Halo universe as we know it. Thankfully you won't have to wait for Chief to get chatty to hear the whole tale - you'll just have to grab a copy of Halo: Fall of Reach. 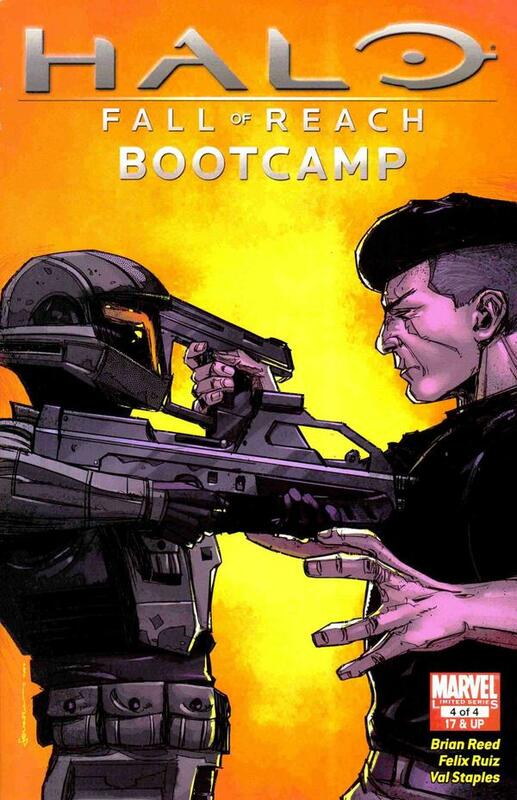 A comic adaption of the novel of the same name, Fall of Reach is broken up into three parts, each detailing an important part of the Chief's life: his childhood abduction and training as a Spartan, the beginning of the Human-Covenant War, and fall of the colony of Reach (which leads directly into of Halo: Combat Evolved). While the events of the comic will be familiar to anyone who's read the novel, the comic's stunning use of color and stark imagery gives it an extra leg up, making it a worthy addition to any Halo collection. Best place to read it: Sadly there's no omnibus for this series and it's not part of Marvel Unlimited, but thankfully the three arcs (Boot Camp, Covenant, and Invasion) are each available as a full volume. Ace Attorney might seem like an odd series to adapt to comic form, since much of its appeal rests in eviscerating your opposition with the power of lawyering. But while it doesn't have that level of interactivity, the Ace Attorney manga fully embraces the series' best qualities and creates a fun side-story for fans to get their Phoenix fix. A five-volume mini-series covering a slew of new cases, its heavy focus on the evidence lets you play a more passive part in the solving of the crime, but nonetheless pushes you to figure out the answer yourself. Featuring brain-teasing puzzles and the charm that the Ace Attorney series is famous for, this manga is great for established fans or new arrivals who want to check the story out before taking on the challenge of crime-solving. Best place to read it: There aren't many options here for those who prefer digital editions or collections, but the individual issues are all available at a relatively decent price. Despite its wide popularity, Kingdom Hearts can be bluntly inaccessible, particularly because different parts of the story are exclusive to different platforms. Thankfully, those who can't swing the purchase of a new system to play a single game can turn to the Kingdom Hearts manga instead, which covers the events of the games in a relatively faithful manner, while adding a few extra bits of story exclusive to print. The most recent (and arguably most helpful) addition to this Kingdom Hearts collection is the five-issue Kingdom Hearts 358/2 Days, which tells the story of Alex, Roxas, and Xion that sets up Kingdom Hearts 2. Laying out an otherwise convoluted story through simple but elegant illustrations instantly makes it easier for fans and newcomers to access the full plot of Kingdom Hearts, and any comic that does that is a winner in my book. Best place to read it: In a vast departure from how Kingdom Hearts is typically organized, all five volumes are available to western readers and can all be found in the same place. That was easier than expected!